Ananda is a global movement based on the teachings of Paramhansa Yogananda, who showed how everyone can realize God in their daily lives as a tangible, loving reality. 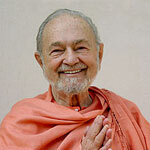 Ananda was founded in 1968 by Yogananda’s direct disciple, Swami Kriyananda. Swami Kriyananda’s spiritual successor is Nayawami Jyotish who, along with his wife Nayaswami Devi, serves as Ananda’s spiritual director. Yogananda’s non-sectarian teachings embrace the truths that underlie all the great religions. People from all faiths and backgrounds are welcomed at Ananda.